The mediastinum is defined as the thoracic region limited by the pleural spaces laterally, the sternum anteriorly, the vertebral column posteriorly, the thoracic inlet superiorly, and the diaphragm inferiorly. The mediastinum contains different types of tissue including the thymus gland, part of trachea and esophagus, the great vessels, the heart, lymph nodes, fat, and nerves. Mediastinal masses can derive from each of those tissue and can be malformative, neoplastic, or infective [1–5]. Table 11.1 illustrates the different origins of mediastinal masses. Ballouhey Q, Galinier P, Abbo O, Andrieu G, Baunin C, Sartor A, Rittié JL, Léobon B. The surgical management and outcome of congenital mediastinal malformations. Interact Cardiovasc Thorac Surg. 2012;14(6):754–9. https://doi.org/10.1093/icvts/ivs035. Epub 2012 Mar 5. Ryan G, Somme S, Crombleholme TM. 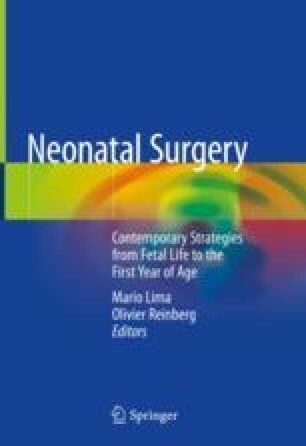 Airway compromise in the fetus and neonate: prenatal assessment and perinatal management. Semin Fetal Neonatal Med. 2016;21(4):230–9. https://doi.org/10.1016/j.siny.2016.03.002. Epub 2016 Apr 12. Goussard P, Gie R, Andronikou S, Schubert P. Rare cause of an anterior mediastinal mass causing airway compression in a young child. BMJ Case Rep. 2015;2015. doi: https://doi.org/10.1136/bcr-2014-208281. Shiraga K, Terui K, Ishihara K, Shibuya K, Saito E, Ito K, Hiramoto R. Pleuroperitoneal shunt for refractory chylothorax accompanied with a mediastinal lymphangioma: a case report. Ann Thorac Cardiovasc Surg. 2014;20(Suppl):654–8. https://doi.org/10.5761/atcs.cr.12-02244. Epub 2013 Oct 3. Pham NM, Alexander PM, Chow CW, Jones BO, d’Udekem Y, Konstantinov IEAnterior mediastinal lymphangioma in an infant: diagnosis and surgical management. Heart Lung Circ. 2012;21(5):289–91. https://doi.org/10.1016/j.hlc.2012.02.006. Epub 2012 Mar 20. Alfaar AS, Hassan WM, Bakry MS, Qaddoumi I. Neonates with cancer and causes of death; lessons from 615 cases in the SEER databases. Cancer Med. 2017. https://doi.org/10.1002/cam4.1122. [Epub ahead of print]. Frazier AL, Weldon C, Amatruda J. Fetal and neonatal germ cell tumors. Semin Fetal Neonatal Med. 2012;17(4):222–30. https://doi.org/10.1016/j.siny.2012.05.004. Epub 2012 May 28. Felgentreff K, Schupp W, Otten JE, Rückauer KD, Uhl M, Jüttner E, Superti-Furga A, Pohl M. Inspiratory stridor and dysphagia in two newborn infants caused by ectopic thymus tissue. Eur J Pediatr. 2009;168(9):1141–5. https://doi.org/10.1007/s00431-008-0887-7. Epub 2008 Dec 23.